Sister site The Huffington Post just went on a journalistic hiring spree (hide your bloggers/hide your editors), scooping up New York Times editor Maura Egan, who will be Deputy Entertainment and Culture Editor under recent hire and fellow NYT alum John Montorio, along with Reason’s Radley Balko who joins as a Criminal Justice Reporter, Rebecca Carroll who comes on as Culture Editor of Black Voices, GOOD’s Amanda Millner Fairbanks as Education Reporter, and Jaweed Kaleem as Religion Reporter. But the most interesting HuffPo new hire doesn’t bring the added name value of an old media publication or any publication for that matter. 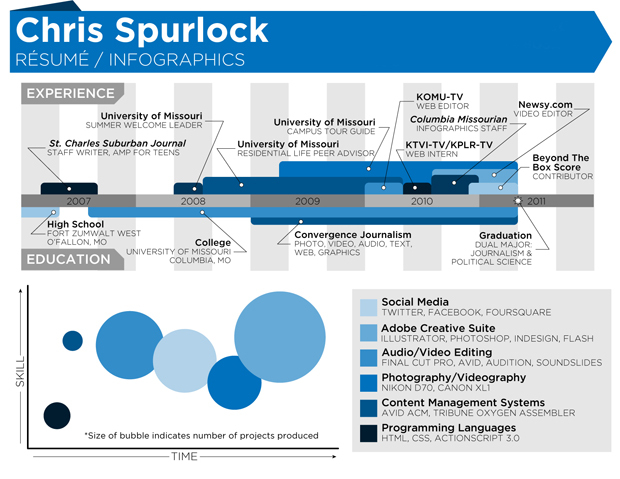 It’s Christopher Spurlock, a journalism student at the University of Missouri, whose ambitious resume as an infographic was posted to Huffington Post College on February 25th, and proceeded to go viral after Huffington Post Traffic and Trends editor Craig Kanalley tweeted it out to his 5,800 followers. The original post, which amassing thousands of Facebook “Likes,” hundreds of tweets, and tens of thousands of pageviews, eventually convinced Kanalley to bring on Spurlock as a Huffington Post Infographic Design Editor, but not before Kanalley wrote a followup post “How to Make Your Resume Stand Out: 5 Tips From Chris Spurlock.” Indeed. The fact that a news organization as large as The Huffington Post is hiring into a full-time Infographic Design Editor position is a serious indicator of the state of journalism to come, and not necessarily in a bad way. After all, you can’t game searches for infographics like you can for posts about what time the Super Bowl starts. People actually have to want to share them in order for a publication to derive traffic benefits. And almost everyone, but especially the self taught Spurlock, loves infographics. Spurlock’s so obsessed that he eventually wants to build a J-School curriculum for people interesting in making visual displays of factual information. Says Spurlock, “I always keep a Twitter search handy for the word ‘infographic,’ and every day there’s something that’s huge. That’s been retweeted a thousand times.” Imagine his amazement when his own creation eventually met with the same fate. Welcome to the Internet, Chris.